The German people of antiquity stand out as Rome’s greatest adversary. Caesar never tried to conquer them, content to have them on the other side of the Rhine from his Gaul. 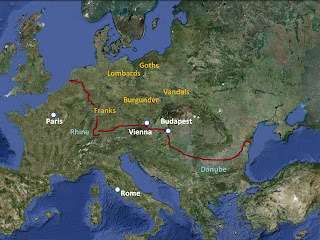 Augustus designed a boundary to contain them using the natural boundaries of the Rhine and Danube rivers. After Drusus and Tiberius, Augustus’ stepsons, set up the southern boundary on the Danube in 15 B.C, Augustus put in place a plan to move the eastern boundary to the Weser river. Drusus accomplished that positioning by 11 B.C. and then pushed on to the Elbe in 9 B.C, before his death after falling off a horse. By the end of his life, and not long after the Teutoburg disaster, Augustus pulled the western boundary back to the Rhine and counseled Tiberius to leave it there. But the Rhine would not be the problem. It was the Danube that would prove to be the sieve through which the Germans would attack Rome and its Mediterranean provinces over a three hundred year period and bring down the empire in the west. They were not one people but a group of tribes inhabiting Germany and points east to the north shore of the Black Sea. Our knowledge of them is sketchy and the facts missing or unreliable, so we have to piece together the history. We do have their names and maps showing where they lived. Caesar spoke of the Chatten, Usipeter, and Friesen. But there were also larger tribes made up of absorbed smaller groups. The Goths, for example, consisted of Ostragoths (eastern branch) and Visigoths (western branch) with varying numbers of smaller tribes included in them. Many times the smaller tribes would go to war with their larger brethren, but remain separate. The map above shows the major tribes of Germany. Each of them would have a significant impact on the future of Europe. The Franks and Burgunder would occupy France, the Lombards northern Italy, and the Goths and Vandals would come to control most of Europe and beyond. I have indicated the location of the Rhine and Danube rivers in red to give the reader a sense of the Roman borders with the Germans. In the next few posts we will describe the major tribes in more detail and show how they were able to destroy the western empire. Thanks for the post; I'll read the next entries with interest. I'm having some recent interest in the V-VI AD invasions. Any good reading that you may want to recommend? 1. Gibbon. The History of the Decline and Fall of the Roman Empire. 2. Norman Cantor. Civilization of the Middle Ages. 3. Scarre. Chronicle of the Roman Emperors. Don't forget the Angles and the Saxons that settled in Britain. There were a ton of German tribes. If the Germans and Romans especially the Romans had been a little smarter.. They would have like the Qin and Han in China have created a universal written script would have laid down the base for uniting Europe. Also if the Anthony-Ptolomy dynasty had been left alone it would have provided a buffer against Persia and save Rome from all those usless and wasteful wars in the east. As for the Germans had played along with the Romans they would have possabilily taken over the empire in the long run. The disposal of Herman would have benifited Europe in the end by allowing for it's unification a opputunity lost.